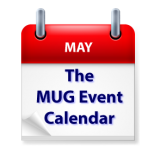 May gets of to a fast start on The MUG Event Calendar. Aaron Davis of Apple will visit a group in the nation’s capital, Pat Fauquet will speak to a Virginia group, and Adam Christianson of The MacCast will be the guest at a California group. Of course, the Apple Watch will be the topic of discussion, or or off the agenda at groups everywhere, while presentations of LibraOffice, iPhone Basics, Mac security, Photos and more are also on the schedule.